On Monday, Prince Philipp and Prince Michael attended the 8th Vernon Smith Prize at the European Center of Austrian Economics Foundation (ECAEF). The topic for this year's event was "Is Edward Snowden a hero or a villain?" 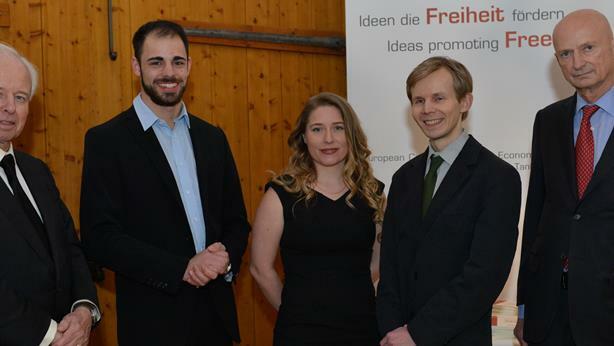 The first prize went to Daniel Issing (shown second from the left, in the photo above) for his economic treatment of the question, ultimately viewing Snowden in a positive light. Demelza Hays from the US (center) and Mats Ekman from Finland (second from the right) won second and third prize, respectively. For more about the event and the winning essay, see Volksbatt. Also, for previous Vernon Smith attendances and topics, see here and here.